Burrr....................chilly and windy here. The forecasters say we are going to get snow by the weekend. We've only had a little dusting so far this winter. Can't complain after seeing what is happening in the rest of the country. It has been a strangely mild winter so far, and way below average rain, and snow fall in the mountains. I've been busy, finished the chair. I'll post as picture as soon as my honey finishes the final coat of polyurethane. The last two Tuesdays I've been trying something new during the off season for sales. I've had an open studio hoping to bring in a little business. Didn't go so good. Don't think I will continue. The only sales I made were items I had posted on FB to advertise the sale. You don't know until you try. I've been posting alot more on Etsy. 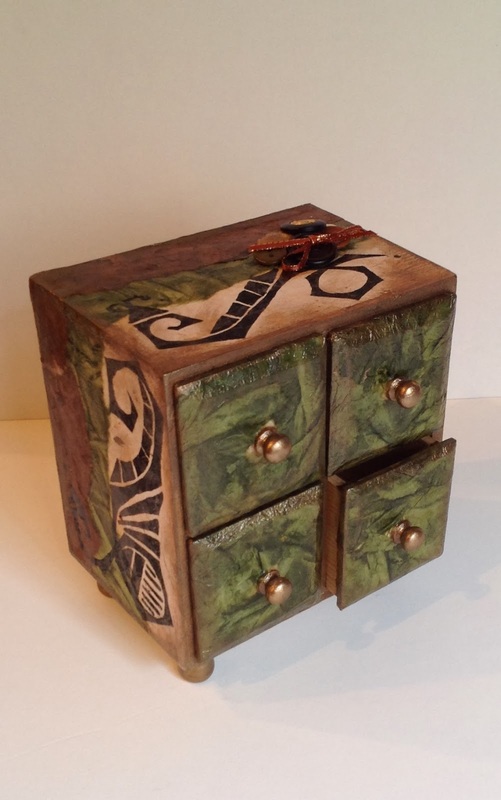 Recycled picture frames and boxes. Here's a couple I just finished yesterday. This one sold already. Yeah! 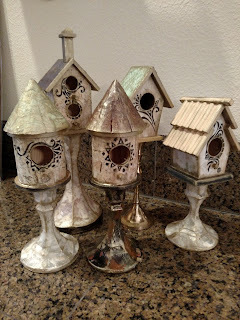 I used some handmade papers I found at an online store, Mulberry Papers and More. I ordered several papers and loved them all. This is layers of several different papers then embellished with the gold leaves. The frame was a thrift store find. 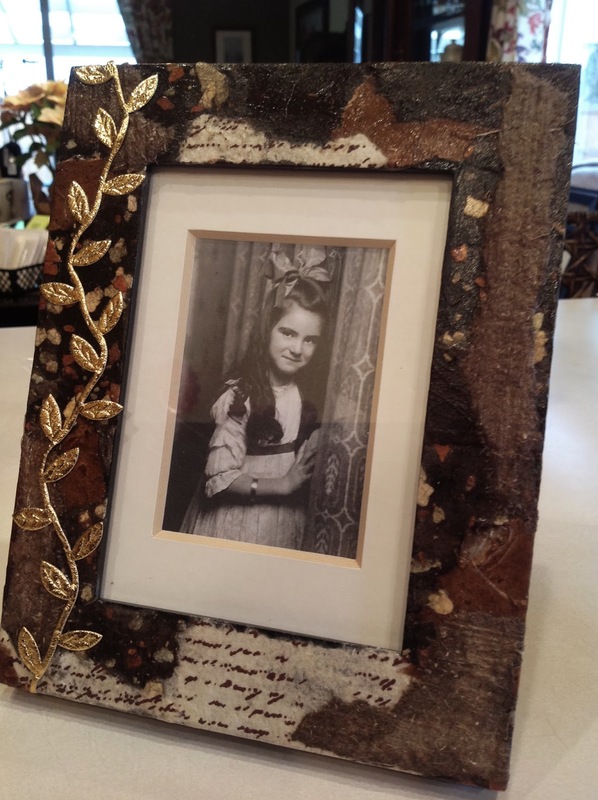 I've been using old family pictures in my frames lately, this is my mother at 6 years old. This frame was in really good shape although it is also a thrift store purchase. All I thought it needed was some doodles. This is also a photo of my mother, her high school graduation photo. Love the hair. This little jewel box, another thrift store find is covered with layers of paper then doodled. A few vintage buttons added on the top. This one is already in my Etsy Shop. I'm hoping to get into a couple of shows this coming season that are recycled art. They seem to be growing and there is so much stuff that people don't want that can be re-made into something useful and beautiful. 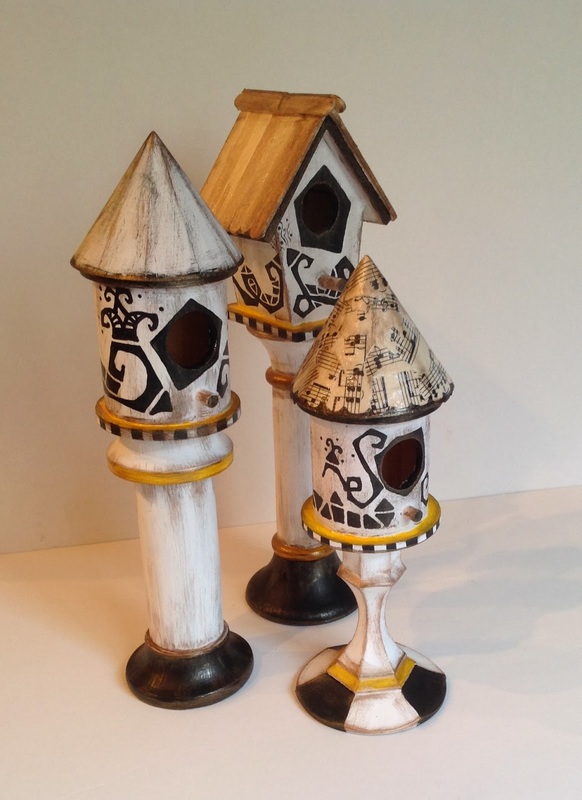 These little birdhouses with doodles are inexpensive craft store finds mounted on top of refinished candle sticks from the thrift store. The tallest is 11 inches. I also used old sheet music for a roof and saved popsicle sticks for another. I live with a fudgesicle eater so lots of popsicle sticks available. As you can see I have been busy creating. I'm finding that I enjoy shopping the thrift stores. It's amazing what you can find. At this point I'm looking for anything I think I can doodle on. Although some take on a life of their own without doodles. That's ok, I do love layering paper. It's that child in me that likes to cut and paste. Need to get moving, I hear the next frame calling and new color of paper to experiment with. I haven'd done a post card swap for several years. ihanna offers a swap twice a year now and they are always fun. Not only to create the postcards but mostly receiving them. Watching the mail box each day to see where the next one might come from. It's not too late if you are still interested, just follow the link above to sign up, you have till Oct 22. ihanna is in Sweden so this is an international swap. 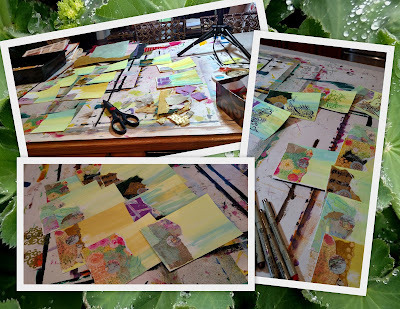 Finally started on my 10 postcards, a little paint, a little collage and finally some doodles. Just waiting for my list of addresses to send them to. It's not like I really needed another project but always fun to do something different. I have 4 scheduled fall/holiday events and another on a wait list. Plus it's football season and the grandsons are playing. By the looks of the wins all 3 teams will be going into playoffs. 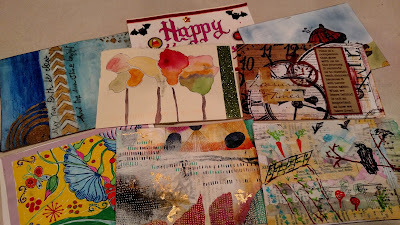 Still receiving postcards in the mail from iHanna's swap this fall. Love getting the real mail and not just advertisements. So far I've received 8 cards, from Oregon, Washington (close to home), California, British Columbia, Arkansas and Virginia. Since I don't have the last two I bet they are coming form some place overseas. Here's a look at the different designs I've received so far. Thank you everyone that sent me a card, some email addresses were not real clear so haven't been able to get that personal thank you out. Fall is definitely here, cold, windy and rainy here today. A good soup day. Stay warm where ever you are. If someone tries to tell you that a bad day at the beach beats a bad day at home don't believe them. I got rained on, hailed on and blown. My poor pup didn't like the hail storm we got caught in while walking on the beach. The first two days were beautiful, didn't even need a jacket the second day. I did know the prospect of good weather wasn't going to last so spent most of the first couple of days walking outdoors. All and all it still refreshes the mind to get away to where none of the things at home can weigh on your mind. We walk when we could, whenever the clouds would break and even in the rain. One day in desperation to get out for a walk we bundled up, rain coats for both of us and went out for a short walk. But you know once you're wet what the heck, keep going. That was the day we took the logging trail up above Rockaway Beach. Even in the rain the view was beautiful and lots of good smells for Fritz. 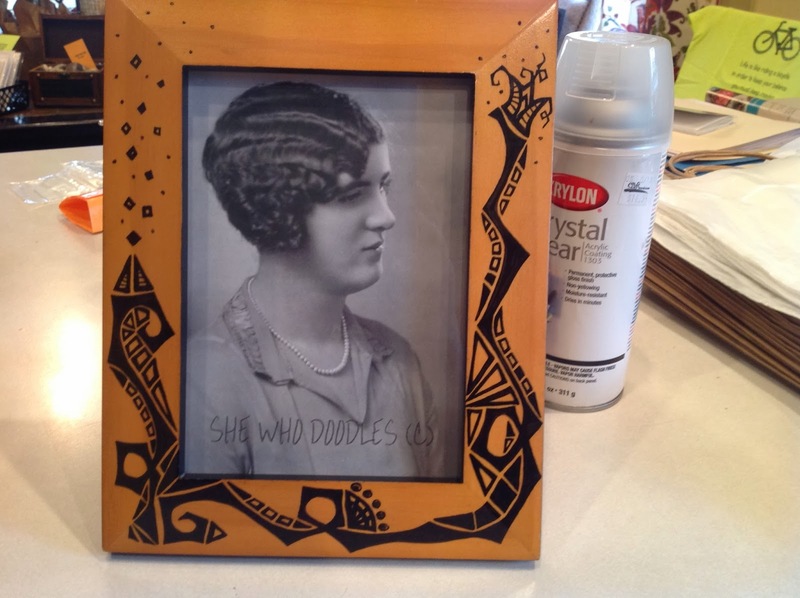 All photos, artwork and written contents are property of Cynthia Eloise Starr and She Who Doodles. All rights reserved. Contents may not be reproduced in any manner without permission. Copyright© 2010 - 2019.